"Manners maketh man — but a Zink suit gives finish," says a Zink & Sons advertising brochure from 1940. Photo: Supplied. 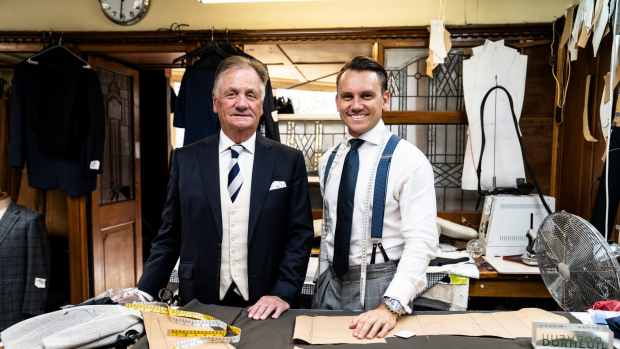 Sydney's best dressed men have been buying bespoke suits from Zink & Sons for more than 120 years, and father-and-son owners, Robert and Daniel Jones, are determined to keep the tradition alive. When Daniel Jones left school, he headed for the golf courses of Sydney's Eastern Suburbs to train as a greenkeeper. The outdoor life agreed with him. "But I didn't love it," he says. So when his father asked him to change tack and join the family business, he was quick to jump off the mower and pick up a pair of shears instead. Rather than keeping greens in trim, he would be cutting suits at Zink & Sons. This is no ordinary family business. Zink & Sons is a Sydney institution. Established in 1895 by German immigrant Gustavo A Zink, it was so popular by the 1940s that there would be as many as 30 customers – from butchers to bankers – queuing up to be measured for suits on a Saturday morning. But men started to get different ideas about what it means to be well dressed. And over the years, the concept of having clothes made to measure became about as commonplace as gentlemen who tip their hats to ladies. So by 2004, when 19-year-old Daniel began learning the art of cutting in the traditional English style (under the tuition of his father, Robert), the queues weren't quite so long. Today, Zink & Sons operates in a more exclusive niche. Customers buying the firm's bespoke suits choose from a selection of English and Italian woven fabrics and have three or four fittings in a process that takes 10 weeks. It's the antithesis of fast fashion, and you could be forgiven for thinking bespoke tailoring is a dying art. But Daniel is determined it won't stop breathing on his watch. "I am very passionate about keeping the traditions of bespoke tailoring alive in Australia for many more years," he says. "Quality is everything." Daniel represents the sixth generation of men to drape a tape measure around his neck at Zink & Sons (three generations of Zinks have been followed by three generations of the Jones family, which took over in the 1950s). Tailoring is in his blood. "I started coming into the shop from a very early age, running up and down the stairs with my older brother and sister," Daniel says. "My father and both grandparents were working at the shop, so I saw all of them involved in the tailoring process." Within a couple of years of joining the firm, Daniel had moved on to coat making, a craft in which he still specialises today, with 15 years' experience in the game. His father Robert, 73, has been at Zink & Sons since he was an apprentice tailor's cutter to his father, Bill, in the early 1960s. He's been delighted to see Daniel bring their traditions into the modern age, with the introduction of new styles from around the world, and innovations such as a computer screen in the workroom, allowing tailors to see a client's shape and posture when they're cutting and constructing a suit. "He has brought a young man's eye to the business," Robert says. "I have been here for nearly 60 years, and Daniel came to the firm at a perfect time. He now has taken full control of the ideas and decisions and has helped us stay at the top of the game." Zink & Sons has had its share of challenges over the years. The 1930's Depression and the rise of ready-to-wear clothing were tough obstacles to overcome, and today, finding suitably qualified tailors is one of the biggest headaches for this father-and-son team. But their business continues to thrive, thanks to a shared passion for their craft, and a bond that is held together with a tight stitch. "We have had our disagreements," Daniel says. "But we move on from them quite quickly. Working with my father has definitely brought us closer together." Robert is confident the family legacy is in safe hands. He's got an eye on the future too, in the form of the next generation of master tailor waiting in the wings. "Daniel has a young son," he says. "Perhaps he'll carry on the tradition and take us beyond our 200th year." Russell's Reserve is teaming up with Zink & Sons for an evening of craftsmanship and bourbon tasting on Thursday 20 September. Tickets available here. Master Distiller, Jimmy Russell has been making bourbon in Lawrenceburg, Kentucky for more than 64 years. Working alongside him is his son, Master Distiller, Eddie. Together they have created Russell's Reserve small batch Kentucky straight bourbon. Russell's Reserve is testimony to the uncompromising approach that comes with over 100 years of combined experience.